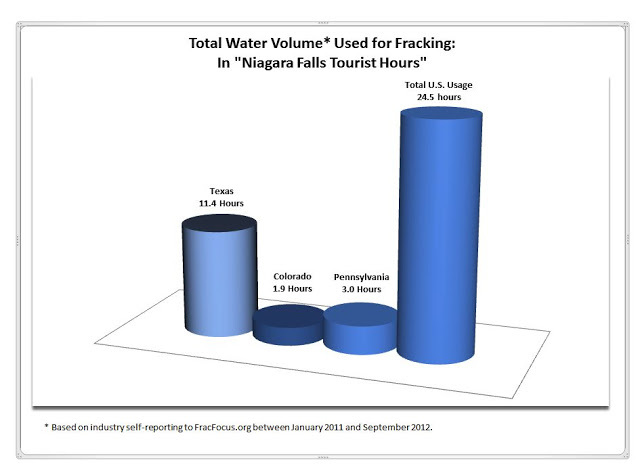 Water, Water, Everywhere: 20 Months of Frackwater in the U.S.
SkyTruth has been looking over industry-reported data from FracFocus.org to see what we can learn about hydraulic fracturing activity across the United States. One topic we were curious about was the volume of water being used by fracking operations. According to a report on modern shale gas prepared for the U.S. Dept. of Energy and others by the Groundwater Protection Council (one of the managers of the FracFocus website), “[t]he amount of water needed to drill and fracture a horizontal shale gas well generally ranges from about 2 million to 4 million gallons, depending on the basin and formation characteristics.” While that is a lot of water, does the data voluntarily reported match this estimate, and what does that look like repeated thousands of times across the U.S.? Looking at these numbers, we find that the industry estimate is fairly accurate but it varies significantly by state. The main variable for the volume of water is the geology of the basin being fracked. Stimulating a conventional shallow well for oil in the Coconino formation of Utah takes much less than an unconventional well in the Marcellus Shale of Pennsylvania, and in some cases, like California’s Monterrey Shale, are ideally suited for low-volume fracking with an average of only 167,506 gallons. Our analyses are based only on the information which is voluntarily reported by participating companies. We have posted before on the lack of complete disclosure on FracFocus, but for measuring quantities, we can easily assume that our calculations will be conservative. Some fracking jobs reuse “produced water” from other jobs, but because it is listed by so many different names, we have not differentiated the amount recycled. With these considerations in mind, you can see that between January 2011 and August 2012, a total of 20 months, the United States used at least 65.9 billion gallons of water to frack for oil and gas, with Texas accounting for almost half of all water use. But as big as these numbers are, what does that look like in the real world? 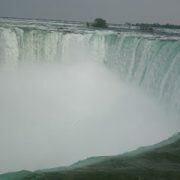 Horseshoe Falls as seen from the Canadian side. 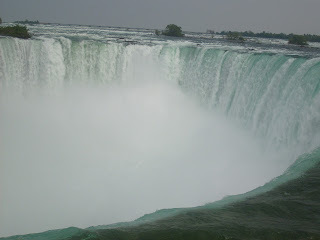 At this rate, we can now see it would take over a day for Niagara Falls to represent the 65.9 billion gallons of water the United States has been drawing from rivers, lakes, and streams, trucking or piping to wellpads, lacing with toxic chemicals, mixing with tons of sand (check back in a few days to find out how much sand and where it comes from), and injecting deep into the ground to get oil and gas. https://skytruth.org/wp-content/uploads/2012/09/Horseshoe_from_Ontario_003.jpg 240 320 David Manthos /wp-content/uploads/2016/08/test_logo.png David Manthos2012-09-14 08:09:002019-02-19 10:42:27Water, Water, Everywhere: 20 Months of Frackwater in the U.S.
Definitely a whole LOT of water permanently removed from the world water system. Thank you for doing this valuable research and analysis and sharing it with us. So we can understand it in a way that's closer to home, do you know how that amount of water translates into domestic use? Like 65.9 billion gallons of water is enough to: supply XXXXXX average U.S. households with water for a day (a year. We are very interested in that number too, but so far we have been unable to pull a number out of the data that we believe is accurate. There are many limitations to the information that we have, and a main one is the lack of consistency in what things like recycled water are labeled in the disclosure forms. Water volume was one of the few parameters that was easy to work with. The U.S. Census Bureau Clocks says that our population as of Sept. 15, 2012 is 314,381,546 people. 314,381,546 people x 100 gallons per day = 31,438,154,600 gallons or 31.4 billion gallons. I think we can see where this is going already, but to make the numbers more representative, let's generalize our numbers so they match. While the exact numbers are going to be a little different, the average water use for fracking based on our numbers is about 3.3 billion gallons per month, and about 39.5 billion gallons per year. That 1.26 means that according to these averages, reported U.S water use for fracking is equivalent to 1.26 days worth of bathing, flushing, brushing teeth, etc. There are lots of other calculations we could do, but hopefully that puts 65.9 billion into a more domestic perspective. Thanks for asking! EDITORS NOTE: An earlier comment with these calculations was in error, upgrading the daily U.S. water use to annual water use. Thanks to redmike for catching the unit error. Hmm… well, I just looked at fracfocus.org and it reports only O(4000) wells in Colorado. About 10% of the active wells here, I think. The county next door has over 18,000 wells. Such a small portion of the wells are reported with fracfocus that I think we can consider this only the tip of the iceberg. Remember that FracFocus has only been collecting reports from industry for a couple of years; the earliest reports are from 2010. So it's only the most recently drilled, unconventional (fracked) wells that are subject to being reported on FracFocus. Older wells, and conventional oil/gas wells that aren't fracked, won't appear on FracFocus. Since modern fracking got underway seriously in Colorado during the 1980s, tens of thousands of fracking jobs that happened in the Rockies between the 1980s and 2010 won't be included in FracFocus. Question for the SkyTruth folks: where do you get the total water # from which you compute the % total consumed for the state? The reason I asked is that the oil & gas commission here says it uses about .08% whereas you say about 8% — what's your source for this info? I'd be grateful for that source, since I'm trying to see how well the ogcc is estimating water use here. We want to share our data so everyone can have access to it, and folks like you can do comparisons and analyses, but for now we are unable to. To our knowledge, only one other such database exists, the D-FRAC database run by a for-profit company. Could you clarify exactly what metrics you are referring too and what .08% OGCC is quoting? Thanks for your interest! I seem to be having trouble posting as well – hope this one goes through. The difference is that we were not looking at total water use budgets, just how much each state was using of the 66 billion gallons we calculated were reported nationwide during the 20 months. We wanted to see which state was using the most water out all the states reporting fracking. Download the "Reports" data from "http://frack.skytruth.org/fracking-chemical-database/frack-chemical-data-download&quot; to a known location. Possible Contamination from Stolthaven Chemical Facility, Braithwaite, LA Meet Katie!